"Jay Kay prefers wedges and has a fair few of them around the stage, so he has a separate console and engineer for them. And as there are 11 other musicians on stage, it makes sense to handle them separately. "There are 60 inputs from stage. I have some extras for the ears and rehearsals, so I'm using all 60 channels on the desk, plus I've snuck another couple in the back door. The entire band wears IEMs and there is a pair of wedges for the keyboard player. "I use the SD8 because the gig fits in a nice size footprint, which is important when you have two monitor consoles to fit in. I think the SD8 has a great spec for its size and price and, despite filling the board with ins and outs, I never feel lost in its layout. And, although we generally tour with our own consoles, if we haven't been able to take our own for some reason being able to find an SD8 everywhere we’ve been is a massive advantage." Dan particularly likes the power and flexibility of DiGiCo's matrix and macros and uses them for a wide variety of things depending on the show. "I've also recently started using the Audio Enhancer FX which I think can be great for really opening up certain mixes," he adds. "DiGiCo have been great and always seem to be on hand to help if I need them. I haven’t had much call for the technical support team, but the sales guys have gone beyond the call of duty in helping me track down boards in various parts of the world." "As the parade moves down the Sambodromo, the delay time and volume of the audio has to be tight, as it has to be distributed to 36 speaker towers," explains Eder. "Each 24 channel snake is colour coded, with each channel being fed to an Aux send. The ‘red’ fibre and the analogue snake provides the audio for the first portion of the street parade, with the trucks being stationary. When the trucks began to move, the ‘green’ fibre and analogue did the second portion of the street parade, and so on, until the end of the 36 speaker towers. 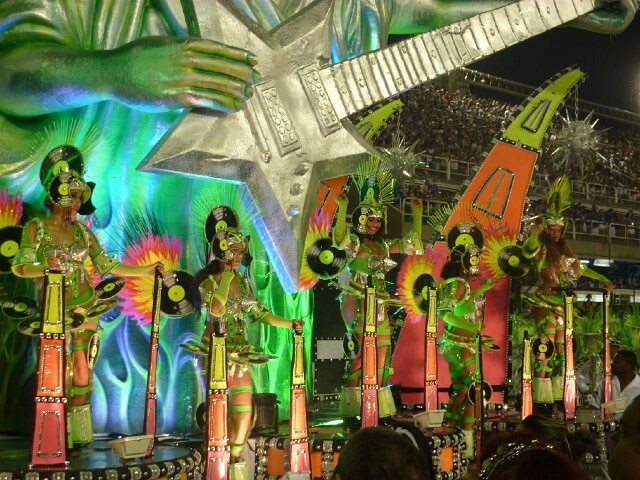 For quick change of snakes, Marcos used Control Groups for each set of snakes and took care of most of the gain changes, plus a spare mix of the parade from the live Samba band, which moved down the 700 meter Sambodromo." 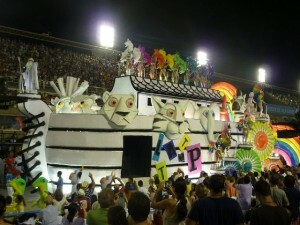 "The Carnival world revolves around these two nights and the schools belonging to this group are thought to be the best and particularly spectacular," Eder continues. "The two nights are similar in terms of set-up, with six of the best 12 samba schools parading on both Sunday and Monday. With the opening ceremony at 20.00, the first school starts at 21.00, and the night’s entertainment generally finishes somewhere around 6am! "The Gabisom team and the DiGiCo consoles are certainly put through their paces over 15-plus hours on consecutive days. Suffice to say that the competition is taken very very seriously and as the main days are all broadcast live to air, the system and team have to be very reliable and professional. "Thanks to Marco Possato Jr, Eder Moura, Peter Racy and, of course, Gabi himself!"